My grandson loves his new comforter. It matches his room perfectly. It’s a great price, quality product and was shipped fast! I will be shopping Overstock first next time. Give any room a fun update with this coverlet set. Featuring a classic camouflage pattern in shades of blue and taupe, the set stands out by blending in, offering a cool, unique look for any space. The comfortable fabric ensures a cozy night, and the set is machine washable for easy cleaning. The brighter blue makes this "pop"! The quilt is a light weight and is well made; Q/F size VERY roomy on a pillow top full bed. Should have plenty of room for a Queen. Navy color is easy to match. Son is thrilled with his "big boy" room and so is his mom! My 7 year old loves it! Very pleased with this set. The quality is great and comforter the perfect thickness. Not too thick or too thin. Great deal! Perfect for my son's room! This quilt is so soft and looks great! 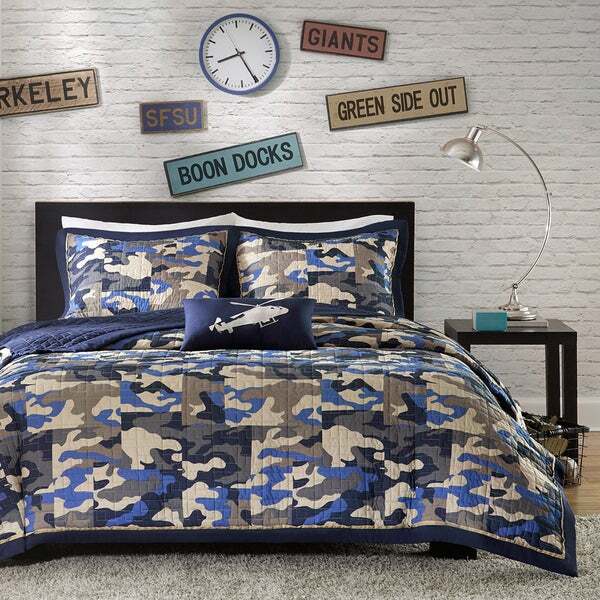 It's perfect for my 6 y/o son who loves camouflage and also loves the color blue. The extra helicopter pillow that's included is super cute. The size is great. I like that it's for a twin or twin XL. There's a little more length to it at the foot of the bed and on the sides, which I like. It's lightweight, yet still keeps him warm at night. It was the perfect Christmas gift! These are such a good quality! Everything came right out of the package feeling butter soft to the touch. I am always worried about the texture of bedding when I order online and was so happy when these sets came and we're so soft! I ordered the twin sets in blue and green sets, one for each twin. They love them so much and are very rough on them, they even took them camping. The quilts are high quality and durable will be around for years to come. The sham and decorative pillow are of the same quality and add the finishing touches to thier room. Bought this for our 9-year-old son’s room and he LOVES it. And so do we! It’s definitley a set that he can keep for a while. There are a couple shades of blue (navy and royal), a deep olive green and a tan color. The stitching is like an elongated brick pattern and is very nice. It seems durable, hasn’t formed any pills and the helicopter accent pillow is perfect for the set. OMG this is so soft. It is wonderful ! I have a military room, devoted to my husband who was in the Air Force. And is a X- Fire Fighter. I put it in that room. It looks Awesome. The colors are so wonderful. The picture does not due it justice. Get it you will not be disappointed. Trust me. Good set! We bought this for my son's room. I really liked the blue camouflage. The color is unique and better than your typical green camo. The set is lightweight which is nice since my son kicks off the covers most nights. Would recommend. My son wanted a green camouflage room and this set was perfect. I am so glad it came in a queen size. It's very soft and stylish. I bought this set for my 9 yr old son. He was very excited when he saw the deep colors and felt how soft the fabric is. It is also warm enough, but not too heavy. Overall, I have been very happy with my purchase. I was looking for a replacement camouflage comforter set for my sons room. The one we had to replace just did not last. This set appears to be very durable, and should not come apart like the last set we had (that lasted a few month.) This was a great price compared to the set purchased at a local department chain store. We are very pleased with the color combination, goes well with black furniture. I would recommend getting this set to anyone that inquires. Impressed with the quality. The quilt is very soft. My son loves it. It's hard to buy bedding for teenaged boys. This is a perfect fit for my kid! Colors are great, and it's top quality. Very surprised how soft this set is, and at a great price! It's got a silky (poly) feel, but he loves the way it looks. great quilt!!! My son loves the colors. I love that its warm and durable and holds up well in the washing machine. Washed it about a dozen times and no fading . It looks so nice in person. Love this. Great buy! My son loves this set, it’s as described. I had washed many times already and the color seem to withstand. Bought this for my 9 year old and he absolutely loves it! It's made of high quality fabric and is not too heavy. And I got it for the best price here at Overstock. This bed cover is a little thinner than I thought it would be. The colors are great and they have made a child very happy. I gave it to my Grandson for his birthday. He absolutely loved it. He didn’t know they had blue camouflage. The smile on his face made it worth it. "Is the green no longer available? I have been waiting for two months for the green to be restocked. Any news on the restock or discontinued? Thank you." At this time, we do not have an estimated restock date set. We welcome you to check back often as our inventory changes on a periodic basis. We apologize for any inconvenience. "Are you going to have the green in stock?" "I just ordered bunk beds. Do you think this set will work on bunk beds?" Yes I actually bought 2 sets for a bunk bed myself . I have to fold under for the stairs to attach . But still looks nice. They are very good quality also. I have had great success with overstock .I ordered this for my grandsons room. Trying to change his room. Two major changes I his life . His mother passed away last month and he turned 13 this month. Great kid .i,think he will love the bed quilt! My 8 yr old son picked it out.